How have you been getting on in this hot weather? Have you been making the most of it? Or feeling frustrated by the heat when you’re trying to work/commute? 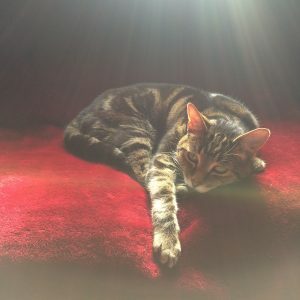 My cat passed away this week. I felt very sad. He had travelled with my family for 16 years, the majority of my children’s lives and a large chunk of mine. Whenever I experience a death, it always makes me ponder on my life more – am I enjoying it? Am I making the most of it? Am I doing what I want to be doing? If I passed now, would I have any regrets? Animals are incredibly healing beings to be around. We often notice this particularly with domestic animals. There have been many studies about the healing benefits of animals, especially with the elderly, the ill and the vulnerable. Our pets love us unconditionally if we treat them well. They can heal, calm, soothe, love and entertain us. Apparently cat videos are the most watched of all clips on Youtube! Saying that I won’t be getting another cat, because in our new house we are surrounded by birds and other wildlife that I am enjoying being the custodian of, and wouldn’t trust a new cat to not chase and catch these beautiful creatures, especially the current brood of 11 moorhen chicks I have coming into my garden every morning. The Buddhists have a large focus on reflecting upon death and our mortality, specifically to ensure we are living our lives fully in the now, the present moment. Are there any changes you could make to enjoy your life more, to live more fully today, to experience life in the present moment more, the ups and the downs and the inbetweens? Hugs are important. Having a hug with a person or animal for 15 seconds or more increases your serotonin levels, your happy hormones which in turn makes you feel good and increases your inner healing capabilities. So try hugging every day for 15 seconds or longer and test this out! Cleanse your Energy field – A guided meditation to help you quickly and effectively cleanse your energy field, your aura, your chakra energy system. Listen to regularly to release any negative energy you may have picked up during your day. You will feel energised and refreshed after each listen. 16 minutes.